May 19th, 2019 - Puppy Water Entertainment is assisting the American Icon Awards to garner support for its Gala Show & Concert on May 19th in Beverly Hills, by raising funds to purchase tickets, tables, a "Meet & Greet" lunch with Al Pacino, or even a Sponsorship to honor Al Pacino, Quincy Jones, & Evander Holyfield. This would be a tremendous help to make this event a success , and to raise more money for The St. Jude Children’s Research Hospital, and The Autism Movement Therapy Organization. There will be many celebrities and major Studio Execs who will be there in person, who all would be so happy if you, the public, can help out in any way. Martin Scorsese is the Honorary Dinner Chairman. Puppy Water Entertainment states,”If there is anything at all that you can do – in any format- it would be so much appreciated by us, and all of our staff, Executives, and Producers at American Icon”. 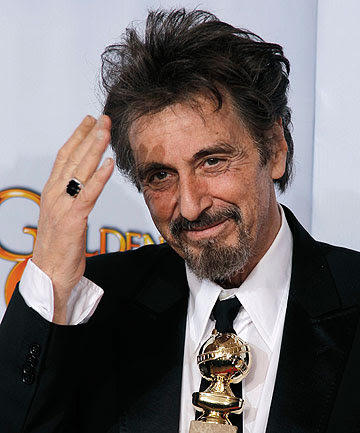 The American Icon Awards tribute to Al Pacino is a Black Tie star-studded Dinner Gala, Awards, Concert, and Show to honor Al Pacino, Quincy Jones, and Evander Holyfield at the Beverly Wilshire Hotel in Beverly Hills, on May 19th, 2019, with only A-List stars and Superstar Performers! Puppy Water Entertainment spokes person states,”We would be honored if you can help out in any way by purchasing individual tickets and/or full tables for the Gala Show and Concert on May 19th. As well as: sponsorship program packages, and business incentives and promotions, TV/Website advertising, and Show Journal Ads, Live and silent auction, and Gift Bag items – product donation great for advertising/promotions! There is also an opportunity for a private VIP Meet and Greet with Al Pacino, and other A-List Celebrities at Spago’s Beverly Hills on May 19th- for a 2 hour long lunch”! All of the basic tickets to the event will include a cocktail reception, spectacular silent and live auctions, a gourmet dinner, awards ceremony and a star-studded concert. You would be a big help towards making this event a big success again as we have in the past! April 20th, 2019 10pm - 2am - Puppy Water Entertainment will hosts its First Annual Fundraiser @ the Barkada in Hollywood, California. Mental Health News Radio Network podcast Puppy Water Radio uses pop culture to bring mental health awareness to a wider community. Puppy Water Radio Host Princess Okieme discussing issues on the importance of Mental Health and how to combat Mental Illness. April 4th,2019 -Drawing on her background as a videographer and transcriber for the Bronx African American History Project (BAAHP), Puppy Water Radio podcast host and Los Angeles based Behavioral Therapist and Social Worker, Princess Okieme uses Hip Hop and other forms of popular culture to spread her compassionate perspective on mental health and mental illness through her podcast Puppy Water Radio, now airing on Mental Health News Radio Network. Aiming straight for the heart of a general public ill-informed about the realities of mental illness Puppy Water Radio reroutes popular movies, TV and videos into teaching tools; the podcast features fun yet intimate, mainly in-person, discussions with actors, athletes, mental health professionals, producers and other entertainment world personalities. Podcast episodes center on guests sharing their personal mental health struggles. Part art therapy session and part social analysis each episode examines how social factors such as legislation and public accommodation intersect with and affect those suffering from mental, behavioral and neurological disorders. The emphasis is on a cool, relate-able format that tackles serious issues. Okieme said, “I have observed in pop culture and society as a whole that people are aimlessly and unknowingly suffering from mental illness, like I once did, and that those within pop culture -especially the youth – find it taboo to talk about mental health. This applies, too, to the Millennial demographic, which according to the U.S. Census represents more than one quarter of the nation’s population; if this demographic of people find it strange to talk about mental illness then that means there are a large number of people suffering”. In addition to Puppy Water Radio – the name comes from a comment the show’s host heard one boy shouting at another in the Bronx neighborhood where she grew up – Princess Okieme is the founder of Puppy Water Entertainment, which opened its doors in 2017. Coming soon for Puppy Water are its first Fundraiser Party at The Barkada Restaurant in Hollywood on April the 20th, a TV series on Autism and a Mental Health Arts festival on August the 31st (currently both in pre-development). Also in the works are a non-profit called The Puppy Water Entertainment Foundation, which will provide a mental health clinic, research opportunities and grants to film makers interested in mental health related content. Puppy Water Radio airs weekly on Mental Health News Radio Network. It will soon be available on KQBH 101.5 FM Community Radio. Mental Health News Radio Network hosts over 30 podcasts covering all aspects of mental and behavioral health and well-being. Its mission is to combat mental health stigma through advocacy, education and dialogue. MHNR Network podcasters run the gamut from leading mental health professionals and coaches to peer specialists and addiction recovery advocates. To date MHNR Network has aired over 10,000 episodes and has listeners in over 170 countries. It is the world’s largest podcast network dedicated solely to mental health and well-being content. 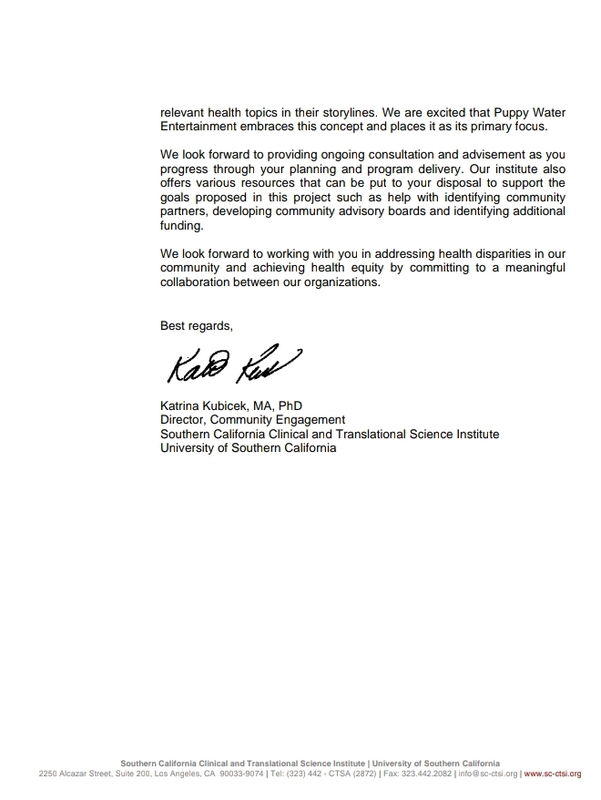 June 22, 2018 - Puppy Water Entertainment secures a partnership with USC’s Southern California Clinical and Transnational Science Institute for its upcoming TV Series “Autism”. Crowdster Announces a New Partnership with a LA-based Entertainment firm, Puppy Water Entertainment, in support of the Girl Rising global movement. Brookville, New York (PRWEB) March 24, 2017 -- Last month, development staff at Puppy Water Entertainment approached Crowdster about a project they had in mind (and the pieces of that puzzle they had yet to secure). Nurturing a growing relationship with the global women’s empowerment movement, Girl Rising, Puppy Water Entertainment needed event management and event marketing support to plan screenings of the movement’s central piece of media, the documentary picture “Girl Rising.” It took nothing more than the chance to exchange services with another enterprise and support a global movement to shatter gender gaps in education and work opportunities to win over Crowdster’s attention and commitment. Directed by Academy Award-Nominated Director Richard E. Robbins, “Girl Rising” presents an answer to the myriad obstacles women and girls face across the world in areas of equal opportunity and access to education film journeys around the globe to witness the resilience and strength of the human spirit as well as the power of education to change the world. The movement demands real, global change to “create visibility for girls, spread the word, gain knowledge, and give the movement for girls' education personal meaning.” Crowdster CEO Joe Ferraro shares, "As a father to six daughters and a missionary who supports orphans - both girls and boys - the mission of Girl Rising is critically important to me. Education is the key to breaking cycles of poverty and enabling individuals to become happy, productive, and contributing members of society." Puppy Water Entertainment's owner Princess Okieme is thankful for the chance to offer Crowdster some public relations support in exchange for Crowdster's marketing expertise, explaining that "every strategy requires collaboration between partnerships." The movement’s website asks anyone who supports the rights of millions of young women and girls denied access to education due to cyclical, extreme poverty and pervasive sexism to “share the film with your daughters and sons, neighbors and colleagues.” That is precisely what Crowdster plans to do. Plans are underway to host a screening of “Girl Rising” on Long Island University's Post campus – which also houses Crowdster’s headquarters – in May, along with a parallel campaign to raise money for the movement from the greater Long Island community. Why does the public’s support count? Every purchase of the film, rights to publicly screen it, and a portion of tickets to attend directly fuel Girl Rising’s movement and programs around the world! Stay on the lookout for details about future screenings produced by Crowdster and Puppy Water Entertainment. Interested in hosting a"Girl Rising" screening? The Girl Rising website has a page for that! About Crowdster Founded in 2007, Crowdster is focused on supporting non-profit and for-profit social enterprise organizations to help them achieve their mission. That support is delivered by a powerful online fundraising platform combined with advanced fundraising marketing services including creative services, event planning, email marketing, and other digital marketing services.